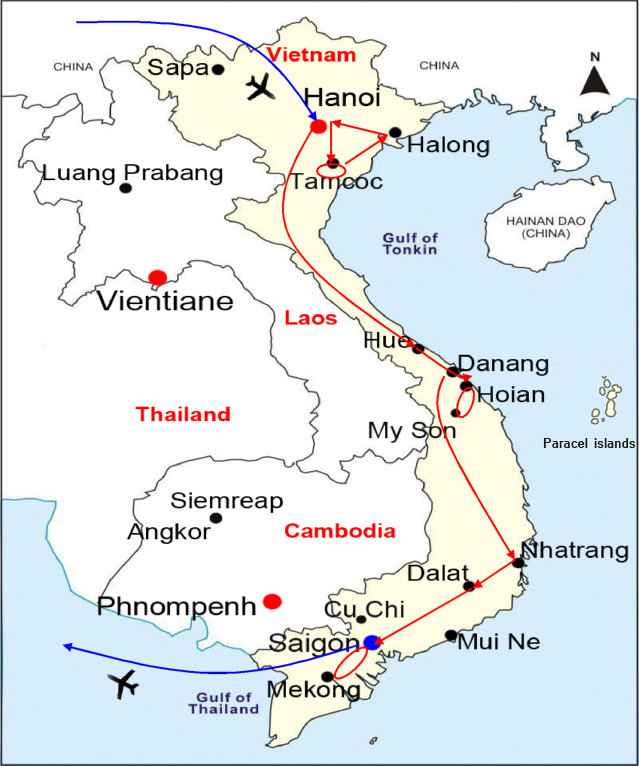 Within two weeks, we can visit the best site to see in Vietnam by cycling, with stops at more places a massive tour itinerary may skip. The tour can get away from busy points even in the high season. Cycle in Cuc Phuong Park, the oldest National Park of Vietnam with unspoiled beauty of a rainforest grown on limestone mountainside. A leisure boat trip in Ha Long Bay – one of the world’s top natural wonders. Relax at a beach in Nha Trang, or join adrenalin water activities like snorkeling, diving, parachuting or sailing. Leisurely explore Dalat with hilly winding roads, pinewoods, waterfalls, farms of tea and coffee. Pedal through tranquil villages and orchards located by Mekong river. Visiting Hanoi, then taking a rowing boat on a picturesque river thru Tam Coc cave. Biking from Tam Coc to Hoa Lu via rural paths and fields. Going to Halong via Hai Phong with visits at ancient sites. Biking thru quiet royal city of Hue, boutique Hoian Ancient town, then relaxing at beaches in Hoian. 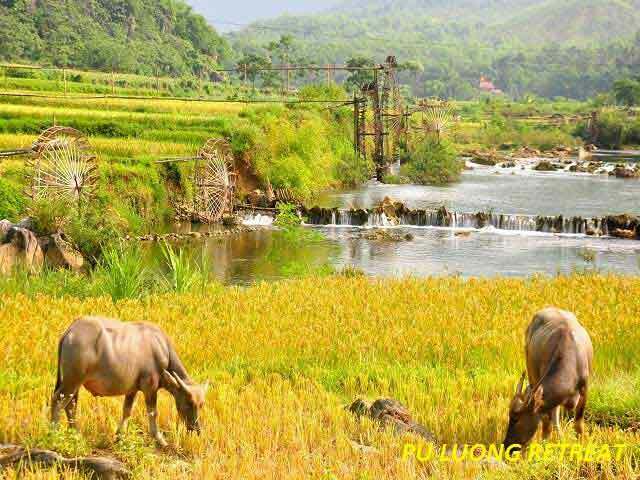 Enjoying countryside at Nha Trang and hill station of Dalat. Cycling in exciting Saigon, contemplating aroma of the Mekong delta orchards. Free visa arrangement for early bookings. English-speaking professional cycling Tour guides. Land transfer by air-con vehicles. Mineral water during touring days. Accommodation based on twin/double-shared room with daily breakfast. Lunch, dinner as mentioned in program. Cyclo trip around Hanoi Old Quarter. Visa stamp fee (Vietnam - USD 25/person, for visa-upon-arrival service), visa fast track (to be arranged upon request). Personal expenses (early checkin, late checkout, drinks, tips). The Tour guide and bus of THREELAND TRAVEL will welcome you at Noi Bai airport; it takes us 35 minutes driving to the centre of Hanoi to check-in hotel. Let’s have an overall view of the capital by a “cyclo” visit, which will start at the Old Quarter, stop at Ngoc Son Temple located on the Hoan Kiem Lake (the “Sword” Lake), and at Quan Thanh Taoist Temple. Dinner and overnight in Hanoi. Please note: Hotel check-in time is around 14:00. Optional: You can try your bikes today visiting all these sightseeing points. Brekfast at hotel. After that, we'll set out for our trip to Cuc Phuong National Park, located about 130km South of Hanoi and is a typical limestone area and rainforest with an impressive variety of animals and plants. Professionallly reserved by Vietnamese government, Cuc Phuong maintains itself as home to some spectacular primates including gibbon, langur, macaque and some fantastic birds including red-collared woodpecker, limestone wren-babbler and fork-tailed sunbird. Half-day cycling in the park under umbrella of century-old trees to explore the forests and trails within the Park’s karst ecosystem will give you unforgetable memories. Overnight at Cuc Phuong Guesthouse. After breakfast, we will leave Cuc Phuong for a short ride to Hoa Lu ancient capital with old temples dedicated to King Dinh and King Le, who had reigned Vienam in the 10th century. 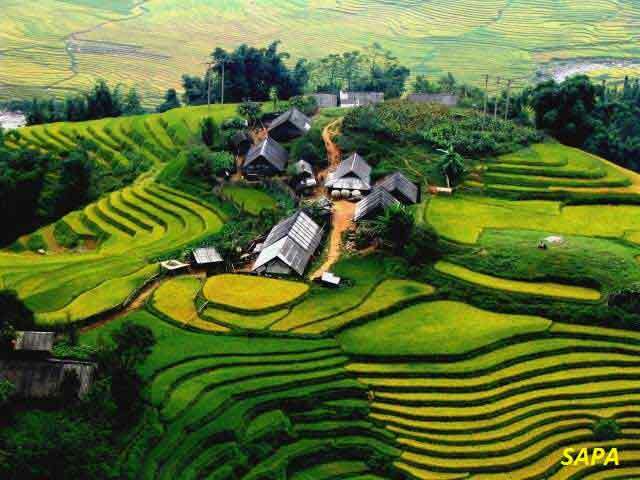 Discover the lowland with 3-hours cycling through rural villages and ricefields before having lunch in Tam Coc. Afternoon, we'll take a 2-hour boat trip round an area, where spectacular limestone karsts jutting out from green paddyfields remind about Guilin of China and Halong Bay of Vietnam, which gives this scenery the name "Halong-bay-on-land". Late afternoon back to Ninh Binh for overnight. After breakfast at hotel, we'll leave Ninh Binh for Halong with stop at Haiphong seaport. Visit Du Hang pagoda, the centre of Buddhism in Haiphong and stroll around the centre of the city. You have chance to admire the Red River delta in its best color and scent in the new-rice planted time in January, and in harvest crops in March, April and November. Upon arrival in Halong, take a big boat to cruise the Bay to discover the magnificent beauty of this “Descending-dragon” bay, created by thousands odd-shaped limestone rocks and grottoes. After a lunch of fresh seafood onboard, we can visit the Surprising Grotto, stop for swimming or kayaking, passing floating villages and approach islets to enjoy their beauty in close distance. Back to the boat for dinner late afternoon. Evening attend activities on the boat or relax at your own leisure. Overnight on the boat near Titov Beach. Please note: The program may change a little upon the cruise's specific itinerary, depending on the tide, season or cruise chosen routes. Only Vietnamese and International food available on the boat. If wake up early, we can enjoy the dawn on the Estern Sea in the early morning. After breakfast, our boat will continue to cruise in marvelous areas, where almost each islet has its own name, adopting its shape or reminiscent like Sail Island, Fisherman’s head rock, Butterfly rock or Turtle islet etc. After a delicious lunch onboard, take our bus to Noi Bai Airport for a late flight to Hue. Welcomed and transfered to the hotel for checkin. Overnight in Hue. Breakfast at hotel. Being recognized by UNESCO as the 1st Cultural World Heritage for Vietnam, Hue is highlighted by the old royal architectural works and low-paced lifestyle. We will have a full-day easy cycling around with morning discover the charm of the city, including the Royal Citadel, Forbidden City, Hue Royal Museum and Dong Ba bustling market. After lunch in a garden-housed restaurant, we will continue riding to visit the Tombs of King Minh Mang and Tu Duc - two best-reserved monuments of the Nguyen Emperors since early 19th and early 20th centuries. Overnight in Hue. Free biking in the morning to enjoy the small but charming city of Hue, which used to be the former Imperial citadel city during 1.5 centuries before the Vietnam Wars since 1945. Back to hotel for breakfast and meeting with our Professional guide at the meeting time before checkout hotel, then depart to see the Perfume river and Truong Tien bridge, one of several contructions built by the company of Gustave Eiffel for Vietnam in 19th century. The bridge, though simple and modest, is a charming symbol of Hue as well as of Vietnam feudal "Nguyen" dynasty. Go on to Thuan An beach where we start cycling along the country roads stretched in the peninsula between the sea and lagoons. After 3-4 hours biking, going thru fishing villages, we will cross the river by a local ferry, then take our bus to Lang Co, one of nicest beaches in Vietnam, where we can stop for fresh seafoods and cold beer for lunch. 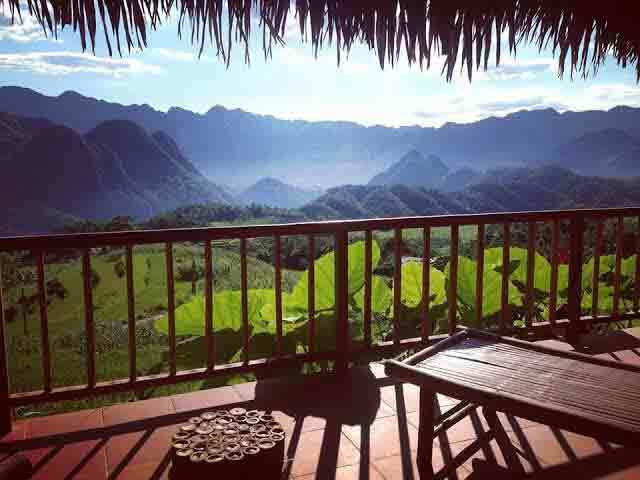 Enjoy our sunbath or swimming here before taking an ascending ride to Hoian town via Hai Van Pass (aka the "Ocean Cloudy Mountain Pass") with stunning panorama of mountain and sea. Checkin hotel in Hoian and have our own leisure in the evening overnight in Hoian. After breakfast, we'll depart from Hoian to My Son Sanctuary, where we can discover the hidden treasure of the Cham culture that was once brightfully developed in the area of nowadays Central Vietnam. Thanks to the mysterious values of the Cham Towers themselves as well as its construction, My Son had been designated early by UNESCO as one of the World Heritages in Vietnam. Cycle back to Hoian for lunch. Afternoon we'll take a ferry over Thu Bon river to more remote villages on the other bank. Just one kilometer from the bustling town, we will discover tranquil areas with boat-making factories, bamboo bridges, local sampans and fishing villages. Pedal on small tracks through ricefields to the rivergate where we take another ferry back to Cua Dai beach before return to Hoi An. Overnight in Hoi An. Breakfast at hotel. Transfer to Danang airport for a short flight to Nha Trang, one of the best 30 beaches in the world. We will have the whole day today at leisure for sunbath, swimming and seafood. Overnight in Nha Trang. Please note! Many water activities available in Nha Trang, including snorkeling, diving, parachuting, sailing to the islands and remote places. After breakfast at hotel we will depart from Nha Trang to Dalat by bus, passing picturesque and photogenic landways adorned with pinewoods, waterfalls, farms of tea and coffee, and Ngoan Muc, the "Picturesque Mountain" Pass. From the elevation of 2,000m with 40km along a winding road, most of cyclists will face the challenge of ascending and getting temperature change, while getting rewarded with spectacular view. Enjoy picnic lunch under the pinewood shade before transfer back to Dalat by bus. This city is named "the jewel of Vietnam Central Highlands", featured by a park-like environment and lovely temperature 15°-24°C and year-round sunlight, which make the city a magnet for all kinds of travellers, from honeymoon couples to senior people seeking relaxation. If time permits, we will have a short city tour round the hilly roads of Dalat to its graceful Xuan Huong Lake. Overnight in Dalat. After breakfast at hotel, we'll checkout and be transferred to the airport for a short morning flight to Saigon. Upon arrival, greeted at the airport by our cycling guide and transferred to the city center for a short cycling before having lunch at local restaurant. (Visits' order may be changed depending on flight time). Afternoon, we will start the visit at the city center by the Reunification Palace, the witness of the fierce Vietnam War ended in 1975. The grand building today is a Museum and Hall of official receptions. Nearby the Palace are the colonial-styled Post Office - another contruction of Gustave Eiffel, and the Notre Dame Cathedral, built between 1877 and 1883 and one of the most beautiful Roman Catholic churches in the South. Cycle to the last destination today, the China Town, only town of Chinese community in Vietnam, and visit sacred Thien Hau pagoda and Binh Tay market. Overnight in Saigon. Breakfast at hotel. Begin our day by bus trip to Cai Be floating market held on the river everyday for vendors and daily trading, especially of tropical fruits and local specialties. Take a boat trip at the marketsite. After lunch, we'll take a ferry to Long Ho peninsula and start our 3-hour cycling within the river matrix. We will pedal through tranquil villages, with bamboo fences surrounding fruit gardens. Take some stops for relaxing, try fresh fruits picked from the trees, coconut candies or tea. Return to Cai Be by boat, then take the bus back to Saigon. Overnight in Saigon. Breakfast at hotel. Free at leisure until transfer to airport for your flight back home. Please note: Hotel check-out time is around 12:00.